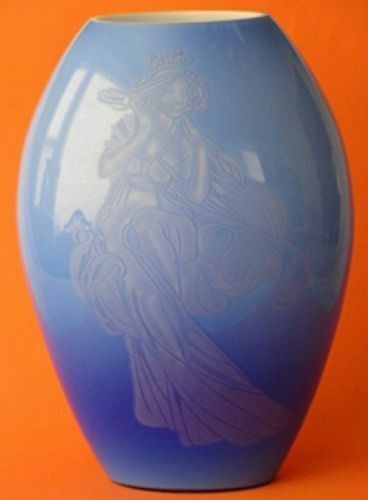 Fenton made "Gabrielle" for their 1985 Connoisseur Collection. This sand-carved vase is 12" tall and in mint condition. Numbered: 233/800. Fenton Temple Jar, Cranberry Coin Spot, 3 pc. 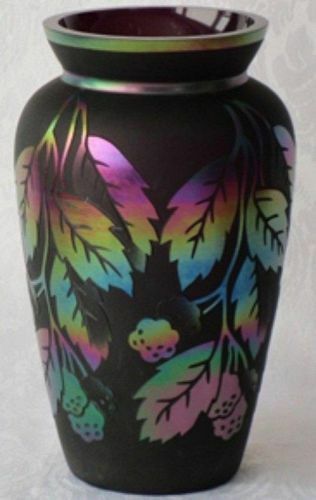 Fenton made this Covered Temple Jar with black cover and stand (3 pieces total) in 2000. It is 10" tall and in mint condition. 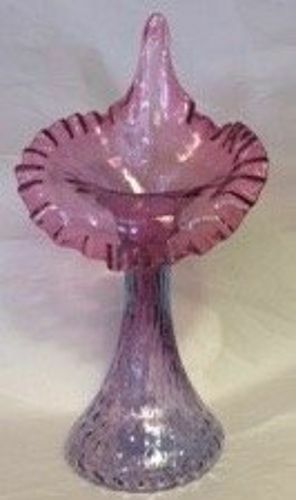 Fenton made this Plum Iridized Sand Carved w/Gold Leaves 9" Vase in 1993 on plum glass. It is in mint condition. Designed by Martha Reynolds, signed by George Fenton and is number 47/950. It is first iridized, then the background is sand carved away leaving the outline of leaves remaining. 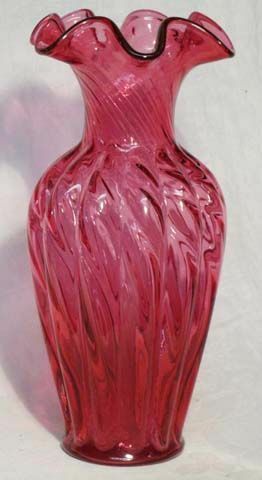 Fenton 3-Paneled Feathered Vase, 9.5" tall. 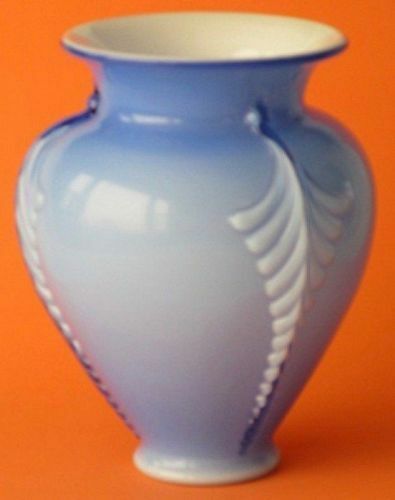 This vase is cased blue, in mint condition. Fenton Sand-Carved Cammeo Cranberry 15" Bowl made in 1994. Designed by Martha Reynolds and Richard Delaney. Only 500 of these bowls were made (this is number 13!). In mint condition. It is part of Fenton's Connoisseur Collection. The red glass is sand-carved away to reveal the underlying milkglass or just sanded away to a thin venear, creating a multi-level layer of color. Please, feel free to ask any questions. 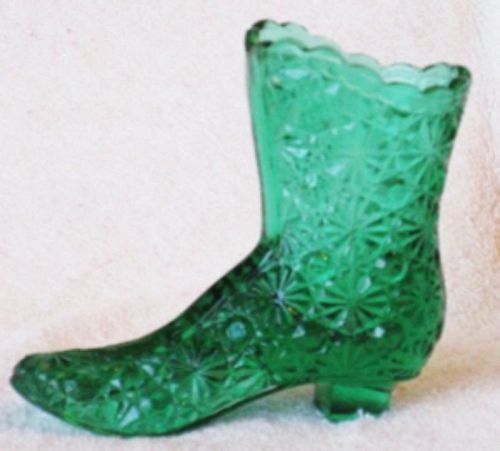 Fenton Spring Green Daisy & Button Boot is about 4" tall and in mint condition. Logo embossed on the bottom. The logo on the bottom of this 11" Cased Dusty Rose Vase is there but not readable. This Spiral Optic Vase is in mint condition. 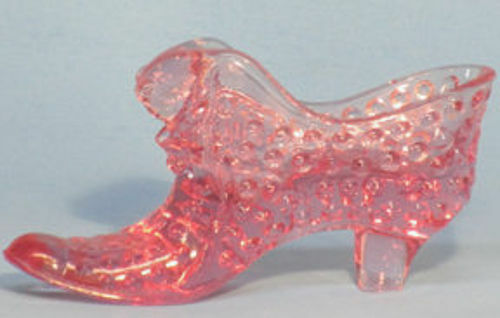 Fenton made this Dusty Rose Hobnail Slipper in the 1980's. It is in mint condition, measuring 5.5" long. 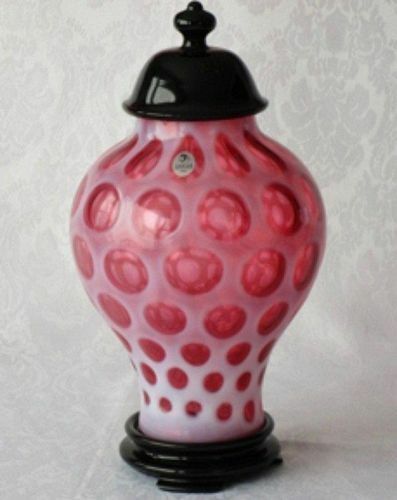 Fenton made this stretched Tulip, Fine Dot Vase, in 1990-91. It stands almost 12" tall. In mint condition. The color is a blend of Gold Ruby and Azure Blue skillfully combined to bring you an exciting lavender glass which shades to a lustrous cranberry edge. It does have the embossed and a paper logo on the bottom. 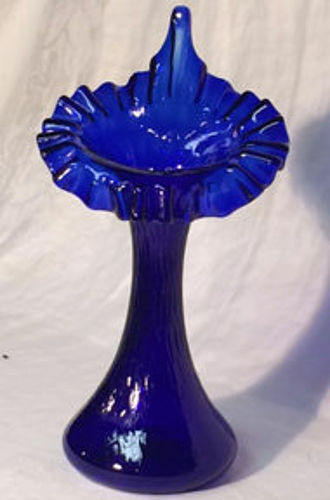 Fenton Cobalt Blue Jack Vase, 11"
Fenton made this stretched Tulip, Fine Dot Vase, from 1988-1990. It stands almost 11" tall. In mint condition. The color is called Blue Royale. 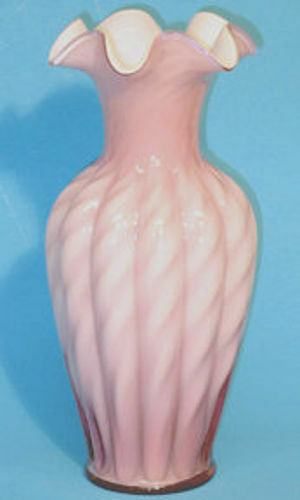 Fenton made this simple 6" Cased Pink Vase in the 1980's. It is in mint condition. 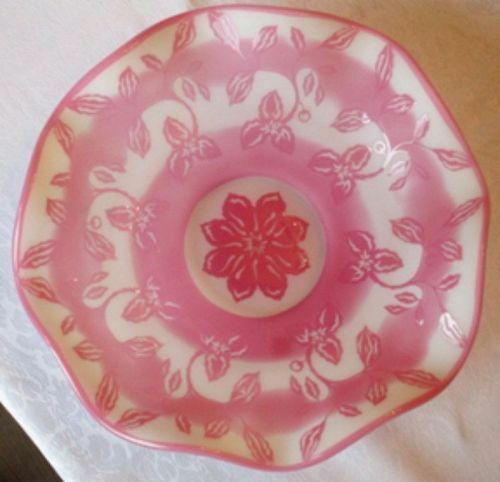 American is a Fostoria pattern, but the company White Hall reproduced this Covered Candy. It stands 7" tall including the cover. In mint condition. Fenton Cranberry Caprice Basket, 7"
Fenton Cranberry Caprice Basket, 7" made in the 1990's (estimated). It is in mint condition. Any questions, please ask. 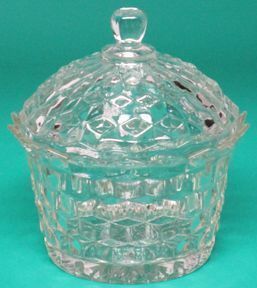 Fenton Mini Basket, opalescent lavendar measures about 4.5" tall and is 4" across at the widest. In mint condition. 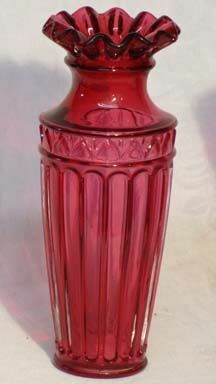 Fenton Cranberry Fluted Column 7.5" Vase is in mint condition. Produced in the 1980's. 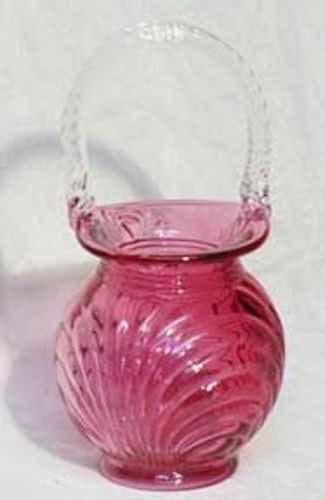 Fenton Cranberry Swirl Optic 11" Vase was made in the 1980's. It is in mint condition. 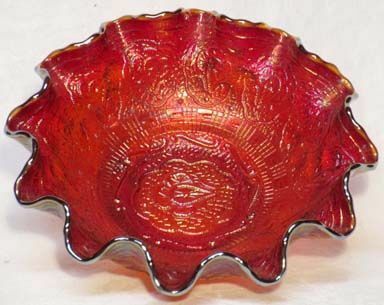 Fenton Carnival Red Persian Medallion 8" Bowl is in mint condition. Shiny, red irridized bowl. Libbey Flat Tumbler, Banded - Ring. We have 4 of these 16 oz. flat tumblers available. All in mint condition with the Libbey "L" embossed on the bottom. 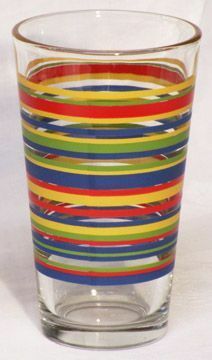 Tumblers are 5-7/8" tall. Sorry, not sure when they were made. powered by Vervendi ©1998-2019 We vend with verve!